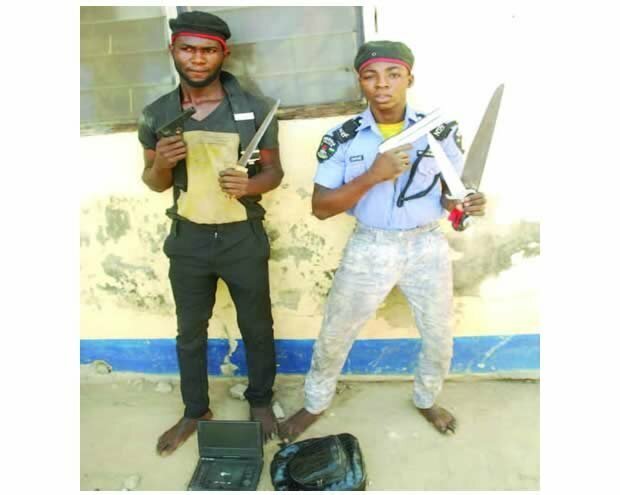 The Niger State Police Command has said that it has apprehended two robbery suspects in a police uniform while operating in Ungwan Liman Madalla in the Suleja Local Government Area of the state. The suspects, Shuaibu Pawa, 27; and Masaudu Haruna, 25, were arrested by a team attached to the ‘C’ Division, Madalla, following a tip-off. It was learnt that the suspects had earlier broken into the house of one Abdullahi Abubakar, a police officer, and made away with his service uniform and other valuables. Northern City News gathered that on Tuesday that the suspects had been operating in the area for some time before their arrest. One of the suspects, Haruna, explained their mode of operation thus, “We can initiate a robbery at any given time without minding what security agencies can do. We rob innocent people at will and make money to take care of ourselves. He confessed that they used toy guns and other dangerous weapons to attack their victims. The Niger state Police Public Relations Officer, Muhammad Abubakar, explained that the suspects had admitted to the crime.